← The Family of Angus McDonell, Eldest Son! The Legend of Uncle Angus McDonald! As a young girl I fancied that Angus was off in the woods somewhere. No one ever talked about him. Of course, my family never talked. My Aunt Miriam called us “dour” Scotsman. I know that Angus and his son George were longshoremen in West Seattle. Angus was supposed to be involved in the organization of the longshoremen and things got a little rough so he had to leave town? My Aunt Miriam seemed to think he was involved in the assassination of the governor of Idaho back in the early 1900’s. She told this tale to a family member as well as the one above about the organization of the longshoremen. I share them with you now. Unfortunately, these two stories have not been proven. The book: Big Trouble, by J. Anthony Lukas, Simon & Schuster, 1997, is about the assassination of Governor Steunenberg and the trial that followed. On page 538 it lists the jurors that were chosen for the trial: Thomas B. Gess, Finley McBean, Samuel D. Gilman, Daniel Clark, George Powell, F. Messecar, Lee Schrivener, J.A. Robertson, Levi Smith, A.P. Burns and Samuel F. Russell. No Angus McDonald is mentioned on this jury or in the book. Another book: The Introductory Chapter to the History of the Trials of Moyer, Haywood, Pettibone and Harry Orchard, by Fremont Wood, Trial Judge NW-R 979.63 W85, Caldwell, Idaho: Caxton Printers, 1931, Spokane Public Library Northwest Room. 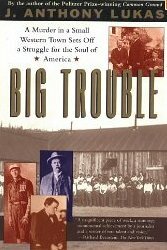 The above book stated that the labor unrest started in 1892 and went on till Haywood died in Russia in the 1920’s. Martial law was declared for all of Shoshone County, Idaho at one time. There were 10-12 miners sentenced to the jail in Ada County. Trials were held in the U.S. District Court at Coeur D’Alene in Kootenai County in August 23, 1897 and 1892. It was a violent and difficult time. Is my Aunt Miriam right or wrong about Angus? His grandson never knew anything of this story. So at this point I cannot answer the question of whether Angus was involved or not in the assassination of the governor of Idaho. I would have to go to the Idaho State archives in Boise to see if I could find anything. To try to get Angus in Idaho at the time of the assassination in 1905, I tried the U.S. Federal Census for 1900 and the Canadian for 1891. I cannot find Angus or his family members. Idaho does not have a state census. Remember Angus disappears after the 1881 Canadian Census where he is with his parents and siblings in Chichester, Pontiac Co., Quebec. He resurfaces when his daughter Helena Mary is born in Chichester in 1897 per the records of the St. Alphonsus Catholic Church in Chapeau. After her birth he disappears again till I find him and his family in Seattle, Washington in 1910. 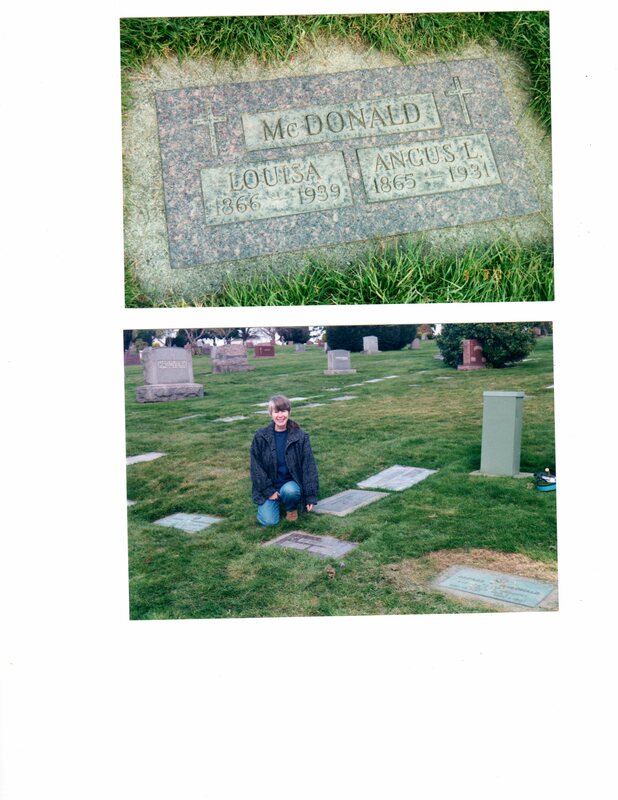 Line 30, 534, 217, 230 McDonald, Angus L., head, Male, White, age 44, Married 1st, age 19 at marriage, born Canadian Scotch, parents Canadian Scotch, Engineer; McDonald, Louisa J., wife, Female, White, age 42 married 1, age 19, , born Wisconsin, father Norwegian, mother Swedish ; McDonald, George W. son, Male, white, age 18, born in Michigan, clerk grocery store; McDonald, Lorne S., son, male, white, age 16, singled, born in Minnesota, apprentice; McDonald, Helen M., daughter, female, white age 12, single, Canadian English, no occupation; McDonald, Rachel, daughter, female, white, age 10, single, born in Wisconsin, no occupation. Source: 1910 U.S. Federal Census, Seattle, King Co., Washington, SD 1, ED 151, Sheet #11A, Ancestry.com. Line 53, 2nd Ave Street West, 401/84/290, McDonald, Angus (S? ), Head 1, Renting, Male, White, 56 yrs., married, immigrated to US 1888, naturalized 1894, able to read and write, born in Canada, English, father and mother both born in Canada, parents speak English, able to speak English, Engineer, Steamer, working. McDonald, Louisa L., wife, female, white, age 54, married, able to read and write, born in Wisconsin, father born in Norway, Norwegian, mother born in Sweden, Swedish, can speak English, no occupation.. McDonald, George Wm., son, male, white age 28, single, able to read and write, born in Michigan, (see parents), can speak English, Electrician, Lineman, working. McDonald, Hellena M., daughter, female, white, age 22, single, able to read and write, unclear about birth maybe born in Canada, Furrier, Dept. Store. McDonald, Rachel, daughter, female, white, age 20, single, has not attended school since 9/1919, able to read and write, born in Wisconsin, stenographer, Real estate. Hanson, Albert H., brother-in-law, male, white, age 67?, single, naturalized 1858/1853, able to read and write, born in Norway, Norwegian, parents same as Louisa, able to speak English, Engineer, Locomotive, working. Hanson, Frank G., brother-in-law, male, white, age 52, single, able to read and write, born in Wisconsin, Norwegian, able to speak English, Carpenter, house, working. Source: 1920 U.S. Federal Census, Seattle , King County, Washington, SD#1, ED 168, Sheet 9B, precinct 97, enumerated January 8 and 9th, 1920, by Edward P. [ ], Ancestry.com. Source: 1930 U.S. Federal Census, Seattle, King County, Washington, Block 7506, ED 414, Sht. 27A, #155, T626-251, pg. 27A, Image 842. Ancestry.com. The 1930 census is the first time Angus is listed as a longshoremen. The ILWU website has a short history of the organization of the longshoremen on the Pacific Coast. According to the 1920 and 1930 census Angus came to the U.S. in 1886. There is some disagreement on his dates of naturalization so that will make it more challenging to try to locate that information. Unfortunately my great-uncle died the following year after the 1930 census of pneumonia. Angus Lawrence McDonald died on 2 May 1931 in Seattle, King Co., Washington. He lived in one of Seattle’s neighborhoods called West Seattle. Angus was buried 5 May 1931 in the Calvary Cemetery in north Seattle. He shares the site with his wife and two sons. The area is one that has been a very big part of my life. The Calvary Cemetery is near the University Village where I have shopped many times. The University of Washington dominates the whole area and my life is tangled up with that school. I didn’t know Angus was so close till 2001.  FindAGrave has some of the burials for the Calvary Cemetery but not all. Angus L. McDonald of 3268 38th Ave. SW, died at Providence Hospital. He had been in the US 25 years. He had been married to Louisa Jane McDonald. He was Born August 5, 1865. He was 65 years 8 mos. and 26 days old at death. He was a longshoremen. He last worked in April 1931. He worked at this occupation 10 yrs. He was born in Canada. His father was Archie McDonald, birthplace was Scotland. Mother’s information unknown. George McDonald was the informant, from San Francisco, CA. Burial in Calvary Cemetery. Arrangement by Bonney-Watson. He had been sick from April 13 to May 2, 1931. He died at 6:45 pm of Lobar Pneumonia (Double). Signed by C.A. Anderson of 4704 California Ave. Source: Certificate of Death for Angus L. McDonald, May 2, 1931, Rec. No. #1577, Reg. No. 1641, Seattle, King Co., Washington Bureau of Vital Statistics, Washington State Board of Health. The Family History Library has these death certificates on film. There are two items on my wish list for Angus. To find out if he was involved with the organization of the longshoremen. The other is, was he really involved with the events around the Governor of Idaho? Until then all will remain a mystery! This entry was posted in Angus McDonald & Louisa Jane Hanson, ARCHIE & MARY MCDONELL's FAMILY, Calvary Cemetery Seattle WA, CANADA, Chichester, George Robert Penglase, George William McDonald, Helena Mary McDonald & Claude Penglase, Idaho, King County, Lorne Sandfield McDonald, Michigan, Minnesota, Miriam's Notes, Pontiac County, Quebec, Rachel McDonald, Seattle, TOMBSTONES & CEMETERIES, Washington State, West Seattle, Wisconsin and tagged Haywood, Haywood jury, Steunenburg. Bookmark the permalink.